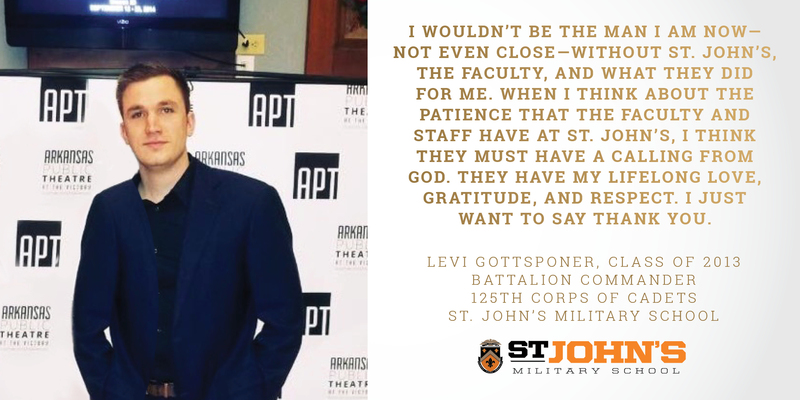 It has been over five years since Levi Gottsponer graduated from St. John’s Military School with the 125th Corps of Cadets, and even though life has taken him to Colorado and eventually back home to Arkansas, he has remained close with his fellow brothers and the school. Gottsponer has also attended three St. John’s commencement ceremonies since he graduated, most recently offering a speech in honor of military staff member Marc Polzella, who retired from the school two years ago. Today, Gottsponer speaks passionately about St. John’s Military School, the brotherhood, and the role the school and its leaders played in helping to set him on a path for success in his adult life. He admits, however, that he was initially resistant to the idea of leaving his home in Fayetteville, Arkansas when his parents decided to transfer him to the military boarding school at age 15 at the start of his sophomore year. The tipping point for Gottsponer—the moment when he began to embrace the opportunities available to him—was the day he earned his first leadership opportunity. Platoon sergeant was not the highest rank that Gottsponer would earn before graduating from St. John’s. The once reluctant freshman would graduate having earned the role of battalion commander. Looking back on his rise through the ranks to the role of battalion commander, Gottsponer recalls how the process of gaining more responsibility taught him to evolve his understanding of leadership. Gottsponer recalls learning valuable lessons of leadership not just in his leadership role, but from those around him, including faculty and staff, and fellow cadet leaders. When asked about the faculty and staff members that influenced his success, Gottsponer’s list is exhaustive. Gottsponer adds one final member to his list of mentors. After graduating from St. John’s, Gottsponer enrolled in the Colorado School of Mines where he earned a Bachelor of Science Degree in Civil Engineering and a Master of Science Degree in Structural Engineering in five years. After graduation, Gottsponer accepted a position back in his home state of Arkansas, 30-minutes south from where he grew up. As an Old Boy who became an influential leader during his time as a cadet, and still maintains ties with the school that helped him succeed, he has advice to share for the cadets about to begin their own St. John’s journeys, and their parents. Gottsponer has one more message he’d like to relay, and this one is to the faculty and staff of St. John’s.